In February, I visited Amsterdam, the Netherlands where the Toyota Denso Cup, European Preliminary Tournament was held. 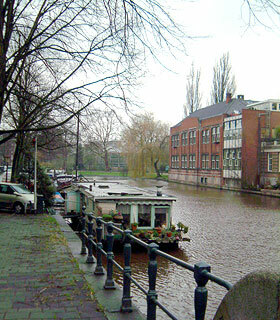 Amsterdam has canals everywhere and looks calm. It was quite windy and the whether changed quickly but I was surprised that it was much warmer than snowy Milan. Buds of trees were growing earlier than usual. As you know, this tournament which has Toyota and Denso as the main sponsors and is supported by Sankei Newspaper is a world tournament started 2 years ago. It is a deluxe event in which the winners receive the European title with Euro 1,500 and the top 3 are invited to Japan to represent Europe at the Toyota Denso Cup, World Go Oza. 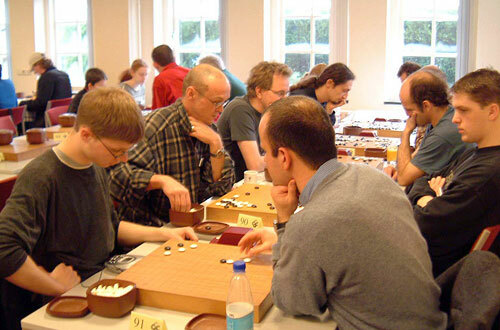 The tournament was held at the European Go Cultural Centre (EGCC) in Amstelveen City, 30 minutes away by tram from Amsterdam. The centre was donated by the late Mr. Kaoru Iwamoto who spent his life promoting Go throughout the world. EGCC is operated by fulltime staff and is an important place for Go activities in not only the Netherlands but also in Europe. According to the name, EGCC seems familiar to a wide range of people because of not only Go but also many other cultural activities like flower arrangement, painting, chess, bridge and so on. Now, at the tournament, 78 participants gathered from 26 countries in Europe. During the 4 days of the tournament, the best 16 were selected in the first 2 days and competed in the final 2 days. It is such a good opportunity for Europeans to see so many strong players at once. At the tournament, Mr. Catalin Taranu, 5 dan, who will go back to his hometown in Romania where he will start promoting Go from this spring came to provide guidance. I have known him through Nihon Ki-in Chubu area since he came to Japan. 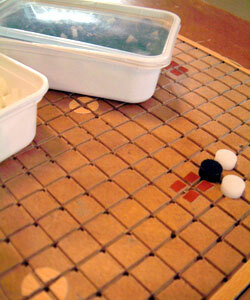 For his wonderful ambition that is to promote Go in his own country, I'd like to support him in many ways. I suppose Go fans in Romania are looking forward to seeing him back. The best 16 of the final were 4 from Romania, 4 from Russia, 5 from the Netherlands, 1 from The Czech Republic, 1 from Luxembourg and 1 from Ukraine. The participants from Eastern Europe and the Netherlands were overwhelmingly strong. Also, more than half of them, 9, had experience as Insei. The average age of those 16 was about 30 years old. They are quite young compared to Go populations in Japan, aren't they? The winner was Andrei Kulkov, 21, a student from Russia. 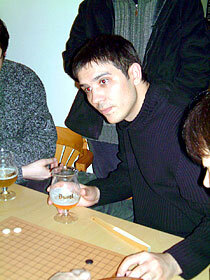 The second was Alexander Dinerchtein, 23, Russian, who became a professional in Korea. 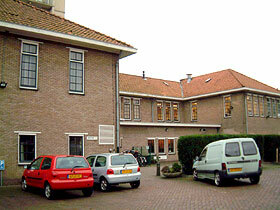 The third was Frank Jansen, one of the staff from EGCC. These 3 received tickets to Japan. After the games, I and Catalin were busy with commentary but it was lively with a lot of people as if there wasn't enough space to stay. Catalin was mainly in a bar doing commentary. 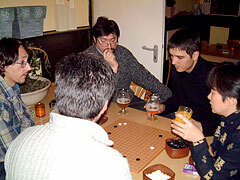 They let themselves loose from the tension of the games and had beer or wine in their hands and enjoyed the comfortable mood. Maybe, that is a good part of European Go. 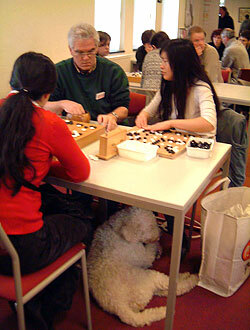 On the weekend, the family tournament in which everyone can participate was held and 206 people took part. Euro 100 for prize for 4 wins out of 4 games and Euro 50 for prize for 3 wins out of 4 games are given. That is also one of the attractions of participating. 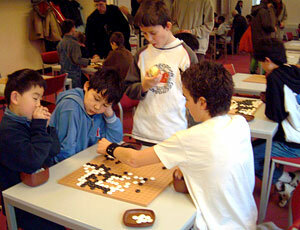 In addition, a lot of events, children's tournament, pair Go, commentary and more were held at the same time. At the children's tournament, it was very lively, too with 32 children and their parents and Go teachers. I heard that there is a Japanese school nearby so that many Japanese children came to the event. It was my first time to see so many Japanese children at the Go tournament in Europe. The comic book `Hikaru no Go' influences children here, too. It is amazing. Also, at pair Go, Mrs. Kim, a visually impaired chess champion, participated. Actually, 2 years ago, I sent her 9X9 Go board for the visually impaired. After that, I sent her some books for beginners and so on through the Japan Go Society for the Visually Impaired. I was anxious about her but never met her. This time, I met her for the first time. It was very impressive to see her enjoy playing games with her guide dog and her special Go board which her friend made. Mrs. Kim, please enjoy Go more and more. For 4 days, it was full of events. 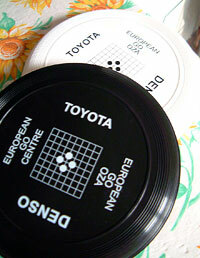 In the end, everyone was satisfied with gifts, a pair of black and white Frisbees printed with Toyota Denso Cup. 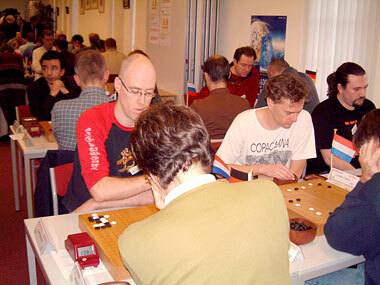 The next tournament is planned to be held in 2006, 2 years later.